Head of State Tun Pehin Sri Abdul Taib Mahmud presented state awards and medals to 114 recipients at Astana Negeri yesterday. Leading the recipients were Pemanca Sahari Gani and Tan Hack Heng, who received the Pegawai Bintang Sarawak (PBS). 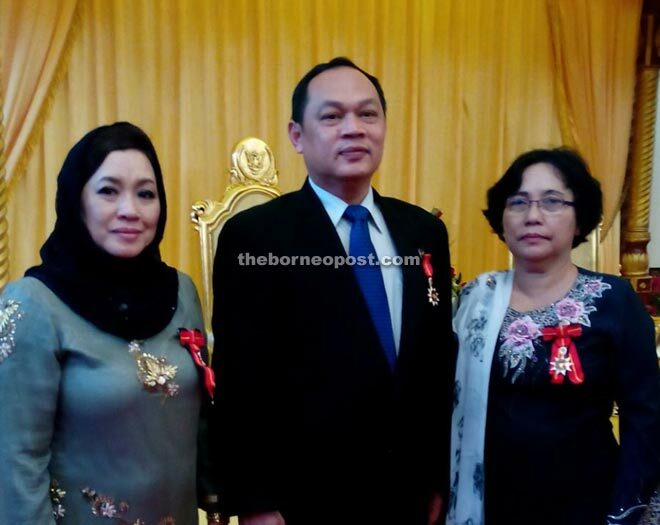 The Pengawai Bintang Kenyalang (PBK) went to five recipients, while 53 others were awarded the Ahli Bintang Sarawak (ABS). Taib also presented the Bentara Bintang Sarawak (BBS) to 36 recipients. Among those present at the ceremony were Taib’s wife Toh Puan Datuk Seri Ragad Kurdi Taib, Deputy Chief Minister Datuk Patinggi Tan Sri Alfred Jabu, Minister of Land Development Tan Sri Datuk Amar Dr James Jemut Masing and Assistant Minister of Public Health Datuk Dr Jerip Susil.